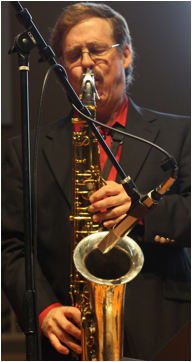 Mike Crotty is a versatile instrumentalist (plays sax, piccolo, flute, clarinet, trumpet and flugelhorn), bandleader, composer and arranger, and recording artist. His music can be heard in a great variety of forums, but he showcased his music for years with his 18-piece Sunday Morning Jazz Band, an ensemble applauded for its compelling innovation, musical superiority and artistic integrity. After graduating from the Berklee College of Music he joined the Airmen of Note, the premiere jazz ensemble of the U.S. Air Force, which carries on the big band traditions of Glenn Miller. From 1972-1998, while serving as their writer/arranger, Crotty became widely recognized as one of the top composer/arrangers in the jazz field today. He has composed and arranged music for hundreds of albums and CD�s as well as performances for such artists as Clark Terry, Billy Taylor, Mel Lewis, Dizzy Gillespie, Stanley Turrentine, Bunky Green, Ernie Watts, Randy Brecker, Ronnie Cuber, Claudio Roditi, Phil Wilson, Bob Berg, James Williams, Sheila Jordan and Diane Schuur. He taught instrumental music and composition at Towson University and Bowie State College and served as full-time jazz faculty in jazz composition and brass at Arizona State University from 2001-2008. The Smithsonian Collection, Big Band Renaissance: The Evolution of the Jazz Orchestra, includes Crotty's "Noel." Dizzy Gillespie commissioned Crotty to arrange the music for performances with the London Philamonic Orchestra. Dizzy later recorded it as The Symphony Sessions. Crotty has also orchestrated music for the National Geographic Explorer television series. A multi-instrumentalist, Crotty plays trumpet, flugelhorn, saxophones, woodwinds, and keyboards. Since 1965, he has been a mainstay in recording studios across the country, having written, produced and performed on thousands of recording sessions for film, television and commercial recordings. His musical career, which spans more than 40 years, has been highlighted by performances with great jazz stars such as Dizzy Gillespie, Clark Terry, Sonny Stitt, Mel Lewis, Randy Brecker, Ernie Watts, Bob Berg, Phil Wilson, Tom Harrell, Pete Christlieb, Claudio Roditi, Louie Bellson, Lee Konitz, Billy Taylor as well as legendary entertainers like Frank Sinatra, Tony Bennett, Mel Torme, Sarah Vaughan, Diana Ross, Ray Charles, Joe Williams, Natalie Cole, Maureen McGovern, Mary Chapin Carpenter, the Temptations and many others. He also played saxophone in the National Symphony�s Pops Orchestra for 15 years.